letting your kitchen cabinets like new! Refacing Kitchen Cabinets can save you thousands of dollars on new cabinets! With Cabinets Bay Area’s exclusive refacing technique you will have brand-new looking cabinets in just a few days. What Make Our Kitchen Cabinet Refacing Better? Cabinets Bay Area offers refacing like no other company will–we take the extra step of replacing the existing cabinet face frames with brand new solid wood frames made to the specific dimensions of your cabinets and secure from the back of the frame with pocket screws. While other companies use a thin layer of veneer with wood adhesive to cover existing face frames (a layer that peels over time), we make new face frames in order to reinforce existing cabinet boxes and create a more solid foundation for new hardware, doors, and pulls. New face frames allow us to make cabinet adjustments in order to update the functionality of your kitchen which can create more space and allow for new appliances. 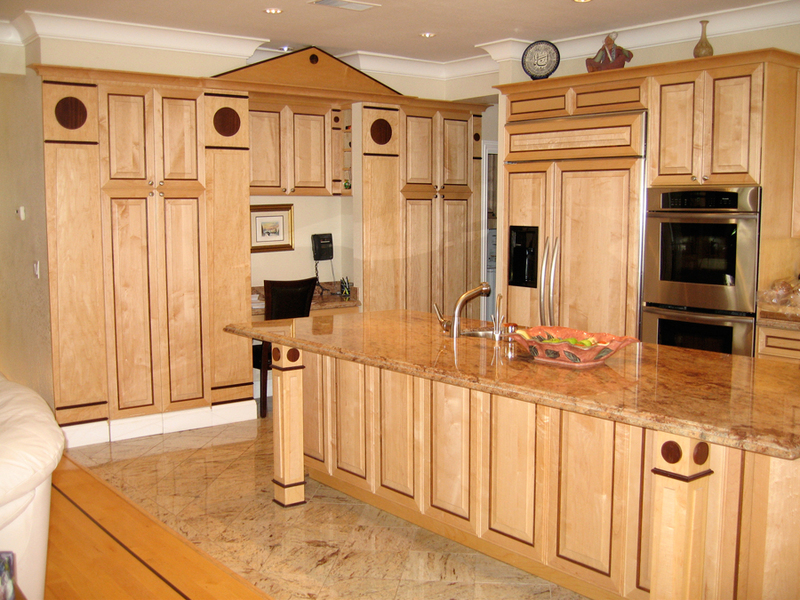 Since 1985 we have specialized in the Art of Cabinet Refacing. With this unique process we can craft a contemporary or traditional kitchen. Whether dramatic, or simple elegance, your design can be achieved with the use of solid wood face frames (wood species of your choice) wood veneers, or laminates. To enhance your storage & ease of use, Custom cabinets, new drawer boxes, & roll-outs can be added to your existing kitchen lay-out. If you want just want to change the color and the finish of your kitchen cabinets, we highly recommend you our Cabinet Refinishing Service. A lovely couple in Willow Glen, California hired us to reface their kitchen cabinets. The result was a spectacular kitchen that looked new, but for half the price of a total remodel! Description of the Kitchen: Maple custom refaced cabinets with cinnamon stain, open, inviting, complete use of space, plenty of storage, and a well situated pantry, hood casing with same texture as the walls, custom hood with moldings with granite inlay, same as the counter-top, built-in ovens , refrigerator and microwave crown moldings all the way around. Needless to say they were overjoyed! After HEMA Designs redesigned and remodeled their chef’s kitchen, our clients from Saratoga asked that we reface their bathroom cabinets to match what we had done in the kitchen! We were ecstatic to continue the beautiful woodwork throughout their home. Description of the bathroom cabinets: Solid wood corbels on the right, rope molding on Crowns and decorative posts, mitered doors, and five piece mitered drawer fronts. Face frame replaced with solid wood frames to match the rest of the custom cabinetry in their home. The finished product was absolutely breath taking. Our client’s kitchen in Mountain View, California is a perfect example of how to maximize space. We refaced all of their cabinets, but were able to add and delete cabinets in order to make the kitchen more functional. For instance, the pantry is behind the built-in refrigerator. We also removed some hanging cabinets and a peninsula in order to give the kitchen a more open feel. We added extra cabinets to “dead corners” and created a small but very functional island. This refacing was inspired by the need to save money and to create a new and modern look for their home. 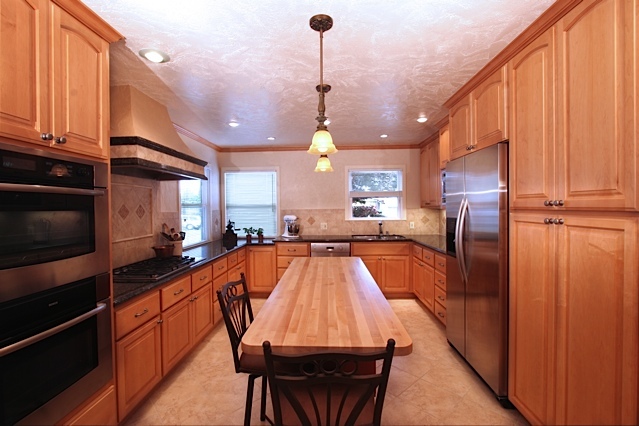 This fabulous refaced kitchen in San Jose, California has kept our clients enjoying complements since we finished! We added more room to existing cabinets and also changed the height of the island to accommodate a bar stools. We increased their pantry area and added a beautiful cabinet for their built-in refrigerator. The look and feel of the kitchen improved 100%. Another happy client! 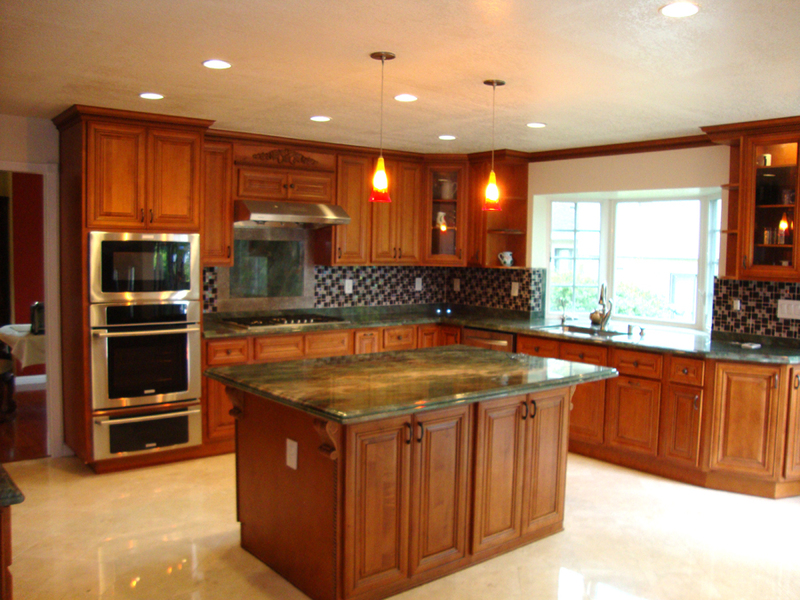 This cabinet refacing project took place in Redwood City California. Our clients were deciding between doing a cabinet refinishing or a cabinet refacing; we recommended them the refacing since the kitchen cabinets frames were old and in this case it is much better to replace them all to make their kitchen like new! without expending too much money; when we gave them the price of the cabinet refacing they took the decision right away. They were atonished by the results, I wish we had a picture of that moment to share with you! Cabinet Refacing Service for Real State Agents. As a part of the remodeling and construction industry, we help real state agents close more businesses in less time and at better prices by offering them our cabinet refacing and refinishing services. With this service we focused on houses that are on sale, making them look better investing just a little amount of money, increasing the opportunity to sell them faster and at a better price . The appereance and the ambient of a property are really important even if it is for sale. 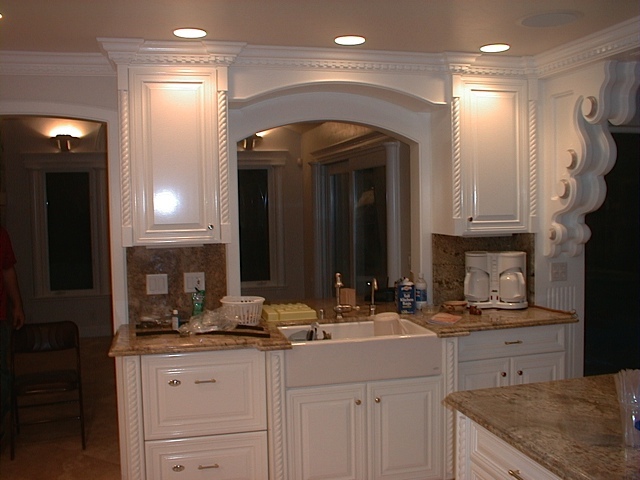 ;by refacing the cabinets of a house you add much more value to it than what you pay for the cabinet refacing service. Kitchen cabinets made of natural wood are a very homely and even though they are durable if the kitchen is well made, there is a time when is good to make a cabinet refinishing or cabinet refacing to make them look as when they were new. In this case because of the frames, we advised our client to do the cabinet refacing , and here is the result, a natural wooden kitchen cabinets like new! Cabinets Bay Area focuses on a specialized technique that allows for a more efficient and durable refacing. 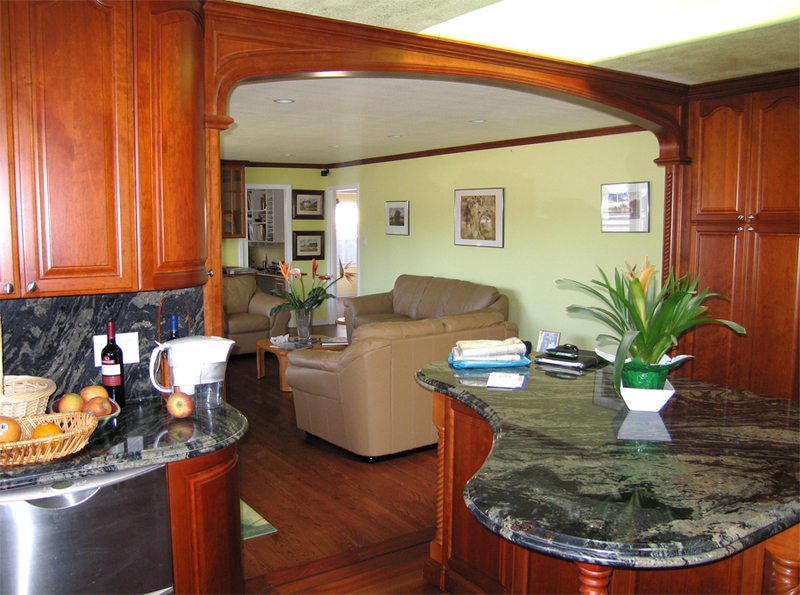 Cabinets Bay Area focuses on 3 distinct techniques for a lasting & beautiful cabinet refacing. Note: all of the above are achieved with wood species of your choice. The best technique to use is to replace what we call: “SOLID FOR SOLID.” We replace the entire face frame of your cabinets with solid, new, wood face frames. You can choose from a wide variety of wood species to change the look and feel of your kitchen. It is almost like having a complete kitchen remodel without all the expenses. This specialized technique has evolved over 30 years that Cabinets Bay Area has been working in San Jose and the surrounding cities. This system allows us to make some adjustments on your cabinets. For example: we are able to make deeper drawers, we can create a space for lazy-susans, or corner cabinets, and in some cases creating a cabinet above your refrigerator as deep as the refrigerator itself! Replacing the face frames with solid wood frames allows for dozens of ways to customize your kitchen. 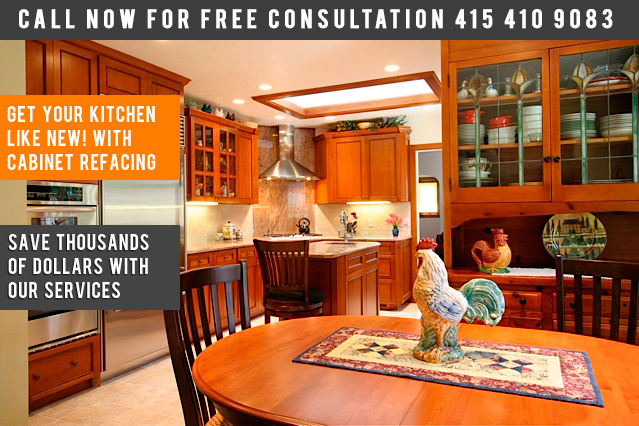 With our FREE in-home consultation we will be able to examine your cabinets. 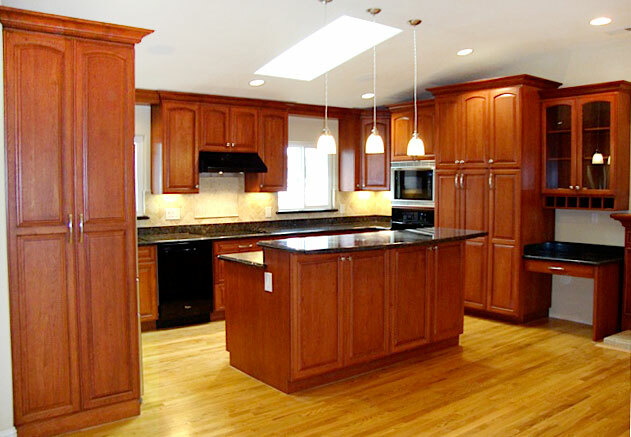 With this evaluation we will determine if your cabinets are the right candidates for refacing. Once the choice has been made to reface your cabinets. We will begin by choosing the type of wood and style of door and drawer that best fits the look and feel you want to create in your kitchen. A designer will then take precise measurements of your existing cabinets, and during this process we will determine which cabinets will be customized. You may want to add a lazy-susan to an unused corner cabinet or you may want to add roll-out drawers or deepening your drawers or even pull-out spice racks to your existing cabinets. We begin to create new, solid, wood face frames out of your desired wood species. We also order all doors and drawers. The demolition in your home begins. We pull off all of the existing doors, drawers, and face frames. 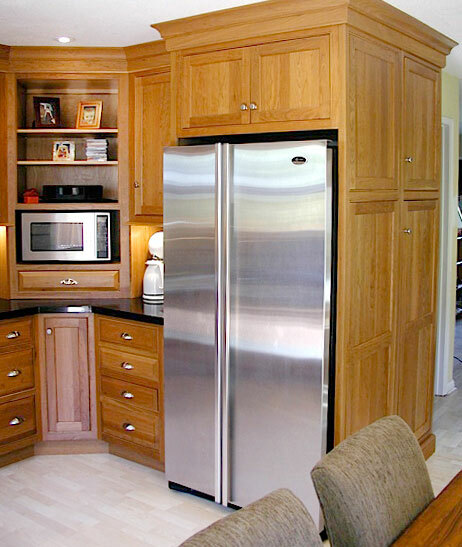 We install the appropriate sized crown-molding to all upper cabinets and base molding around all the lower cabinets. Always trying to use at least 2/3” wide for the upper cabinets. Install drawers on undermount, self-closing, full extension slides. Roll-outs will be installed on self-closing, full extension glides. Install all doors on European, self-closing, hidden hinges. Install all drawer fronts. Enjoy your beautiful, new refaced kitchen. Atherton, Belmont, Brisbane, Burligame, Campbell, Clayton, Colma, Cupertino, Daly City, East Palo Alto, Foster City, Fremont, Half Moon Bay, Hillsborough, Los Altos, Los Altos Hills, Los Gatos, Menlo Park, Millbrae, Milpitas, Monte Sereno, Morgan Hill, Mountain View, Pacifica, Palo Alto, Portola Valley, Redwood City, San Bruno, San Carlos, San Francisco, San Jose, San Mateo, Santa Clara, Saratoga, South San Francisco, Sunnyvale, and Woodside. Map of the Main Cities that We Serve with the Cabinet Refacing Service.